Attention! Fan of G36, the next generation G33 compact assault rifle fits modern special warfare requirements is brought by ICS airsoft in the urban CQB enviroment, shooter needs to be prepared for all elements and situations. Therefore, ambidextrous interface on CQB weapons is critical. ICS cares the desire and crucial needs of AEG players and builds the G33 of quick access fire selector from either side for action agility and task accomplishment. The charging handle in real battle field is another important feature for battlers out there. The ICS G33 made with this advantageous feature on the newly developed AEG for adjusting Hop-Up from either side for player's agility. 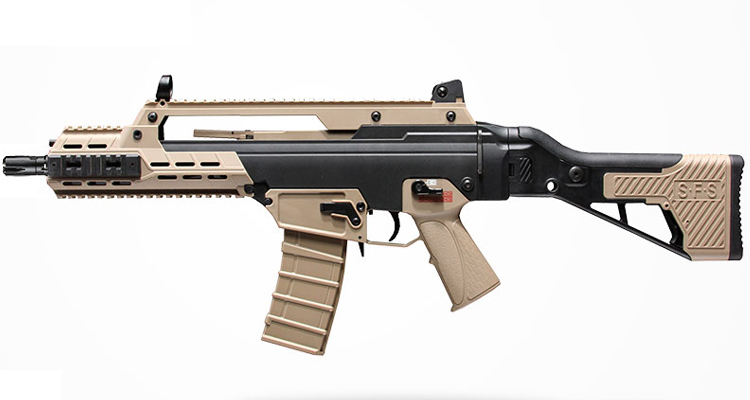 Since the folding stock design is the most effective way to reduce weapon length, for the urban combat situation, ICS has developed SFS (Situation Flexible Stock) not only with folding design, but also the stock pad of 4 adjustable lengths, 3 adjustable heights on cheek weld and a QD swivel socket on each side. Opening the bolt cover to adjust HOP UP. Handguard allows installation of 9.6V 1500mAh Mini type Battery. Remember to check out our Store for battery, charger, extra magazine & accessories. Fantastic Gun! My first proper purchase from JD. Went in looking for SIG 552 and saw this and instantly fell in love. Even though it's mostly polymer you cannot tell from the weight. Its sturdy, no wobbly bits and fires fantastically with a LiPo battery. Folding stock is sturdy and holds in place once folded without the use of annoying clips. Shares mags with most M4/M16 varieties so you can use a wide range of makes (to your preference). Out the box the FPS is around 315 so is welcomed at all sites, and even for a CQB type gun has a fantastic range using .25's. All in all extremely happy with this gun and cannot fault it for looks or practicality.